Your posting of the article advocating “Holy War” is shocking; not only for its incongruity with the Gospel of Peace; but its complete dissonance with the clear teaching of our Patriarch, the reverend Hierarchs of the See of Antioch and its Orthodox Theologians. It seems our local Orthodox internet pundits have abrogated to themselves an authority above their superiors to alter the Gospel and the tradition of the Orthodox faith. We do not fear the testimony for Jesus Christ in every time and place; however, we are people of peace and the product of the peace Inventor. We have Metropolitans and priests who had been kidnapped for more than two years now, within a suspicious and shameful International silence. They are the Metropolitans of Aleppo Youhanna Ibrahim and Paul Yazji. We have priests, monks, nuns, people and martyrs – their only crime is that they hold the entity of Christianity. We have brothers who were forced to immigrate, others obliged to pay tributes. We have people carrying their lives over their hands whilst living within the rockets range, which did not spare a school nor civilians, nor military people in Damascus and all around Syria. We have in Lebanon a country moaning under the exterior forces and conflicts living under the constitutional void and flames of kidnapping as well. We are not talking about protection of Christians as if Christians are factional, isolated from others. We emphasize and say that protecting Christians and everyone else happens through establishing peace in their land. Protecting the Orient, happens through planting olives and empowering the peace foundations and not through aircrafts and providing weapons to attack unarmed civilians. Protecting the East and its people happens through turning off the fire of wars. Protecting this land happens through looking with humanitarian eye to all what is happening not in the eye of interests. From here, from this place, I raise my voice east and west and I say to all the world. Let us live, let our people live, and do not make our land a circuit of conflicts. What is happening in our land is a blind terrorism that we are not used to. His Holiness rejects war as a mechanism for reconciliation, then why do you endorse it? Fr Georges Massouh: Holy Wars… Ridiculous! “My kingdom is not of this world” and not “My kingdom is not in this world” was Christ’s response to Pilate when he interrogated Him before handing Him over to be crucified. Christ denied that His kingdom was “of” this world– that is, in the image of this world, in the image of the kingdoms of this world. Christ did not despair, despite His objectivity, of man’s ability to attain perfection. He did not want to completely close the door in man’s face. Rather, He wanted him to try to establish a kingdom that would be up to the standards of the Gospel. The “Christian state” in its various forms and identities has failed, from its establishment under Constantine the Great down to our present day. This state failed because it was “of this world”and was unable to be different from what prevailed among the nations. Indeed, with their brutal practices and the atrocities that they committed, Christian kingdoms have perhaps provided the ugliest examples among nations. Christ realized this when He disdained and mocked political authority. On the day when He was crowned as a king, the day of His entrance into Jerusalem, unlike the custom of ancient or modern kings, He rode a donkey. He rode a donkey after having previously fled from the crowd when they wanted to make Him king. His closest disciples, like that crowd, did not understand Christ’s logic, since they asked Him who among them would sit at His right and His left in His glory and almost quarreled over this question. They asked for an authority for themselves that they did not receive from Him. Christ realized this, and nevertheless He called on Christians to be committed to the affairs of the world and of people, to defend values and virtues and proclaim the truth. Christianity, contrary to what some may imagine, is a religion that is not only concerned with spiritual matters but also strives for a better world where peace, justice, love and mercy reign… This requires struggle against evil and sin. Even though historical experience is discouraging in terms of the possibility of this promised, ideal kingdom, its realization is not impossible, even if it is difficult. A church historian once said that Christian emperors ruled more harshly than pagan emperors because a pagan emperor considered himself to be a god among many gods, while a Christian emperor considered himself to be the one God’s sole representative on earth. In reality, today there is no “Christian” state and no “Christian” president or leader in the image and likeness of Christ on the face of the earth. Therefore the wars of this state and this ruler are not in any way “holy”. People are free, in matters of politics, to support this or that state in their wars, but not in the name of Christianity or in the name of the Church and not under the pretext of protecting the existence of Christians or under the pretext of defending minorities. The logic of the Church must be other than the logic of this world. Russian “Holy” War in the Eastern Mediterranean and Syria? The Middle East is once again demonstrating its international geopolitical and geostrategic centrality at the intersection of Asia, Africa and Europe. This is shown by the start of Russian intervention and airstrikes in Syria, but also by the forces of the Western coalition, the Chinese navy, without mentioning the consequent regional military forces of Iran, Turkey, Saudi Arabia, Israel and so on. This center of the world that is the Middle East constitutes a strategic crossroads of influences that pivot on a central geopolitical line of three B’s– Berlin, Byzantium and Baghdad– that can cut the world in two.Since the earliest times, this center has not ceased to be a crucible where the appetites of the great powers manifest themselves, meet and kill each other. Today, the confrontation between all these powers that are gathering in the Eastern Mediterranean around the Syrian conflict, raging in this threatened and threatening region, is at its peak under “open skies”. An impressive deployment of fleets, friendly or hostile, that are concentrating unprecedented military resources, whether logistical, intelligence-gathering or command posts. A theater of operations where nations and their most divergent interests oppose each other and where the most voracious passions and tensions are growing. A veritable inferno stoked by explosive regional and international embers, threatening the region with general conflagration at any moment. There is, of course, the context of the internal Syrian conflict, but also the conflict against Syria. There is also the regional context of an Arab world imploding from within with nation-states long dominated by dictatorships and draconian autocracies. Nations-states of the Arab world that were unable to remedy the situation with a liberating Arab Spring are today decaying and giving way to a vacuum that is being filled by an extreme religious radicalism that gleefully wields unspeakable terror on a regional and international level and does not hesitate to reawaken all the old demons. Thus it reawakens and stirs up at will the old internecine wars of Islam, between Shiites and Sunnis. Thus it exploits the sacred for political purposes without restraint and disenters the old demons of the historical subconscious of this region that is still traumatized by the memory of the Crusades and colonialism, associating the Western coalition fighting it with the Crusaders. Entering into this powder-keg context a few days ago came a communication from the spokesman for the Moscow Patriarchate, Archpriest Vsevolod Chaplin, commenting on the military operations that his country has commenced in Syria from the point of view of the Russian Orthodox Church. These statements were repeated, commented upon and crossed the world like lightening, launching a war of the airwaves. Some did not hesitate to carry over into his comments a language of “holy war”, while for others it was not a question of “holy war” but of a fight against terrorism that the spokesman described as a holy struggle. In any case, the unfortunate statements which were corrected by a subsequent declaration by His Holiness Kirill, Patriarch of Moscow, provoked a terrible shokewave and over-excitement in the media, on social networks, and in public opinion both East and West, with extreme opposing reactions of approval and disapproval, with some not hesitating to compare the Russian deployment to a Muscovite crusade in the manner of ISIS. Clearly, this unfortunate incident highlights the risky nature of any attempt to use the sacred in the current explosive context of the Middle East, something that can only unleash murderous passions. More than ever, we must pay attention to the power of the words that we use because words, in our world of digital revolution, are weapons that kill long before the guns kill! More than ever, churches must maintain a positive distance from these risks in order to avoid any unfortunate amalgam that could result when the interests of nations and powers are at play. More than ever, churches must keep intact their fundamental capacity, in accord with their evangelical mission, to act intelligently and courageously for peace and reconciliation. No, there is not nor can there be in Orthodoxy any theological, strategic or tactical legitimization of war, even if it is described according to the situation and the era as “holy”, “just”, “justified” or “justifiable”. Clearly, for every Orthodox Christian, every war is reprehensible and should be condemned because they are and only can be the expression of evil in the world. War is at once a failure and an evil. The Lord reminds us in Matthew 26:52-53, “Put your sword in its place, for all who take the sword will perish by the sword. Or do you think that I cannot now pray to My Father, and He will provide Me with more than twelve legions of angels?” Did Christ not have the possibility of calling upon legions of angels to save Himself from death? His Church is called in every era and according to the specifics of every situation, to intelligently and sometimes pragmatically follow His absolute Model and One Thing Needful, remembering that true “holy war” is that which is invisible, spiritual warfare, the pnevmatikos polemos that Saint John Chrysostom so often mentioned in his homilies. ….People are free, in matters of politics, to support this or that state in their wars, but not in the name of Christianity or in the name of the Church and not under the pretext of protecting the existence of Christians or under the pretext of defending minorities. The logic of the Church must be other than the logic of this world. Those people who rush to the Bible in order to justify their words and deeds that are not in accordance with Christ excel at producing some verses in support of their errant opinions, but only after cutting the passage off from its context and distorting it from its true intent. Quite a few have resorted to this method in order to back up their opinions about what is falsely and slanderously called “holy war”. Jesus’ saying, “Do not think that I came to bring peace on earth. I did not come to bring peace but a sword” (Matthew 10:34) is the verse most commonly cited among supporters of the idea of holy war. However, if we continue reading the passage in which this verse occurs we will discover– if we allow ourselves to be guided by the exegesis of the Fathers of the Church– that it has no connection to military wars or struggles or battles. The text continues with Jesus saying, “For I have come to ‘set a man against his father, a daughter against her mother, and a daughter-in-law against her mother-in-law’; and ‘a man’s enemies will be those of his own household.’He who loves father or mother more than Me is not worthy of Me. And he who loves son or daughter more than Me is not worthy of Me. And he who does not take his cross and follow after Me is not worthy of Me. He who finds his life will lose it, and he who loses his life for My sake will find it” (Mathew 35-39). Again, the irony. Fr George Massouh’s “desire” (even “lust”) is a false “peace on earth” where we are simply to die (in a false martyrdom) – a world where in the name of “peace” he would have us turn the Alter of Christ (i.e. the bloodless sacrifice) into a very bloody one indeed. It is important to remember that the holy Fathers rarely relied on the literal reading of the Old Testament stories. Rather, they most often interpreted those stories in an allegorical sense. For example, the commandment to war against the Amalekites is interpreted as a command to undertake spiritual war against the passions. This form of interpretation is best illustrated in “The Life of Moses” by St Gregory of Nyssa and int “The Great Canon” of St Andrew of Crete. We should also remember that the early Christian Roman Emperors deliberately delayed their baptism until shortly before their deaths, as they knew that their military exploits were inimical to a Christina life. The first emperor to be baptized earlier in life, was Anastasios who became seriously ill and was not expected to survive. We should also remember that the many soldier saints were canonized as martyrs, that is as victims of violence, not as perpetrators of violence and war. The very concept of an ‘Orthodox Christian jihad’ is a serious deviation, even a heresy, as can be seen by the vigorous opposition of our Antichian hierarchs and theologians to this idea. This is Russian government propaganda discussed as theological opinion; but it is not in accordance with the Gospel nor the teaching of the Orthodox faith. In reality, the Putin government is not fighting in Syria to protect the local Christians. If it were so, then they would have done so long ago. Where was Putin when our Archbishops were kidnapped by the Chechens or when Ma’aloula was sacked and our nuns held captive? Putin is in Syria now to prevent the next jihad in Russia. You see, fully one quarter of the Jihadists in Syria and Muslims from Russia. These Jihadists groups are the inheritors and descendants of Muslim mercenary armies formed by the Russian government in the 1990’s under the umbrella of the “Confederation of the Mountain Peoples of the Caucasus.” These militias were used as surrogates in the Russian invasions of Georgia and the attendant ethnic cleansing and genocide against Orthodox Christians in the occupied territories. Later these Muslim militias rebelled against their Russian overlords and eventually morphed into the “Caucasus Emirate”, which is allied with Al Quaeda and ISIL. Putin now fears that if Bashar Al Asaad falls and the war in Syria ends, these jihadist will return to Russia to carry on jihad on Russian soil. 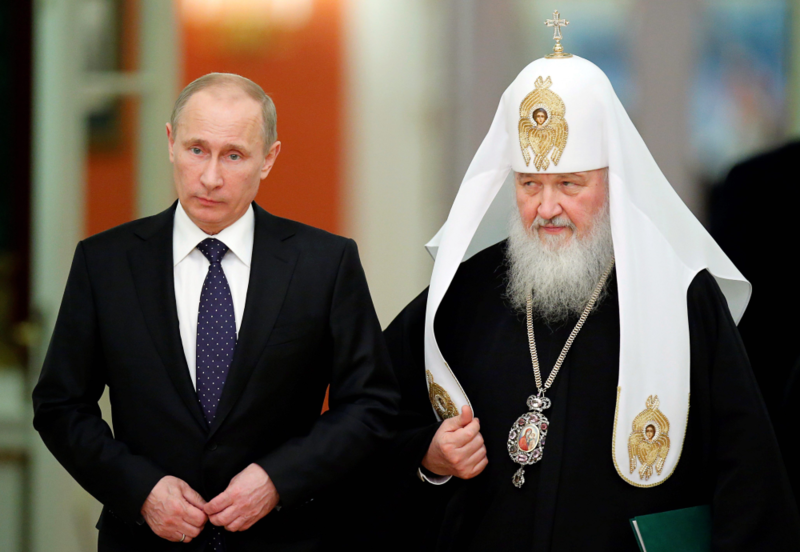 The idea that the Russian government is a protector of the Orthodox faith is absurd. In the invasions of Georgia, Orthodox holy places and clergy were specifically targeted. In 1992, the holy martyrs, Hieromonk Andrea Kurashvili and sub-deacon Giorgi Adua were brutally tortured and killed by the Abkhazian forces under Russian command. In 2008, the Russian and Ossetian military rocketed the ancient Ghvrtaeba Cathedral and the Shrine of the Protomartyr Razhden in Nikazi. The next day, the looted the cathedral, desecrated the holy altar and then burned that ancient temple of God. Can such people be considered protectors of Orthodoxy? Of course not. The sad fact is that there are some who want to insinuate politics into the life of the church. Such ‘political Orthodoxy’ is a deviation from the truth of the Gospel and a deception of the evil one. Sadly. Fr Johannes has still not explained why he is publishing theological opinions contradictory to the clearly expressed teaching of our Antiochian Orthodox Patriarchate, its hierarchs and theologians. Francis, you are amplifying a rather minor point and one I am not interested in defending. The point of the article is the failure of US policy which has contributed to the uprooting the Christians of the Mid-East and fostered their persecution. That is why I posted it. Secondly, this blog is not your personal soapbox. If you want to pontificate, start your own blog. Frances, we’re done. You end up dominating every discussion with your mile long posts. Start your own blog. Seriously. I wouldn’t trust anything that comes out the mouths of the hierarchs on this issue as they have to be ‘ultra-careful’ muttering all the usual protestant guff related to the subject a) for fear of reprisals and b) to keep the secular world (aka Mammon) from seeing red. In private of course they all toast the Putin pilots ! And God bless them we all should ! Christians have been crucified and burned alive in a genocide reminiscent of the Armenians, now at last they have some hope. Glory to God! Amen, Robert! I am an American and hang my head in shame for the actions of the current administration. We are fighting our moral battles here on our own soil, so I am thankful that President Putin has heeded the call to intercede in Syria…I do not think him nor President Assad monsters, but this opinion is the result of my own research. Far too many people are eager to embrace whatever attitude media tells them to take. His defense of Syrian Christians is an answer to prayer. I’m always amused by the claim that Christianity and Christ are pacifists. To me the suggestion is ludicrous given His identity as Second Person of the same triune God who appears to us in the Old Testament. Christ even tells his apostles to arm themselves after the Last Supper (Luke 22:36) [btw, the exegesis regarding fulfilling a prophecy utterly fails to explain why Christ exhorted his followers to go out and buy swords, though it might otherwise explain why He allowed some of them to carry swords. I mean, did they go out to the 24/7 armory that very night to purchase swords just so they could appear like brigands later?]. He frankly tells them that when He sent them out before, they were relatively safe. This time, they out to be prepared to be confronted with violence. He praises Old Testament figures who engaged in violent endeavors, neither He nor John the Forerunner told the Roman soldiers with whom they spoke to quit soldiering, etc. Moreover, imagine a feckless Christian allowing a bully to strike him 70 times 7. I think such sayings are exhortations to patience in civil society, employing the hyperbole characteristic of the language He spoke (“If your eye offend thee, pluck it out . . .”). Besides, if we were to take His words literally on these matters, there could be no Christian government and Christians, one and all, would be at the mercy of anyone who dared to use violence. That is certainly not the history of the Orthodox governments or Church Fathers. Recall that St. Basil declined to call killing in warfare murder or unlawful. Thus endeth the reductio ad absurdam. Russians do have a phrase for “holy war”. It was used during WWII, “Священная война”. Btw, does one use “spiritual” scrip and sell “spiritual” cloaks in order to purchase “spiritual” swords? Inquiring minds want to know. Thank you for this gem of a quotation. Saint John of Kronstadt speaks similarly. Allegory is a wonderful thing and a very useful method of application of the Scriptures to our lives, but it needn’t be to the exclusion of history. It seems that some are so embarrassed by history that they cannot bring themselves to admit to it. And because something happened (often at the command of God) that seems repugnant to modern sensibilities they cannot bring themselves to accept that “God could do such a thing.” But just because these things happened (again at the command of God) at a specific time and within a specific context doesn’t mean they apply in the same way to us. This, it would seem, is what they (wrongly) think they must admit if such things actually occurred. “Therefore chastenest thou them by little and little that offend, and warnest them by putting them in remembrance wherein they have offended, that leaving their wickedness they may believe on thee, O Lord. For it was thy will to destroy by the hands of our fathers both those old inhabitants of thy holy land, whom thou hatedst for doing most odious works of witchcrafts, and wicked sacrifices; And also those merciless murderers of children, and devourers of man’s flesh, and the feasts of blood, with their priests out of the midst of their idolatrous crew, and the parents, that killed with their own hands souls destitute of help that the land, which thou esteemedst above all other, might receive a worthy colony of God’s children. Nevertheless even those thou sparedst as men, and didst send wasps, forerunners of thine host, to destroy them by little and little. Not that thou wast unable to bring the ungodly under the hand of the righteous in battle, or to destroy them at once with cruel beasts, or with one rough word: But executing thy judgments upon them by little and little, thou gavest them place of repentance, not being ignorant that they were a naughty generation, and that their malice was bred in them, and that their cogitation would never be changed. For it was a cursed seed from the beginning; neither didst thou for fear of any man give them pardon for those things wherein they sinned. For who shall say, What hast thou done? or who shall withstand thy judgment? or who shall accuse thee for the nations that perish, whom thou made? or who shall come to stand against thee, to be revenged for the unrighteous men? For neither is there any God but thou that careth for all, to whom thou mightest shew that thy judgment is not upright. Neither shall king or tyrant be able to set his face against thee for any whom thou hast punished. Forsomuch then as thou art righteous thyself, thou orderest all things righteously: thinking it not agreeable with thy power to condemn him that hath not deserved to be punished. “But what about the innocent children?” They themselves were spared from being reared in such wickedness, quite possibly to their eternal destruction. Death is not the end, nor is it the worst thing imaginable. God is both merciful and just.